For some unknown reason, waffles are not yet their own food group. I’m working on it, though. As a self-proclaimed waffle-connoisseur, it’s my duty to bring you nothing but the best waffle recipes. Protein waffles are great for what they are, but it’s hard to replace an authentic waffle with a protein-based one. Too often, you need to give up that beautiful waffle texture we all know and love. But I am very proud to say that is not the case here! 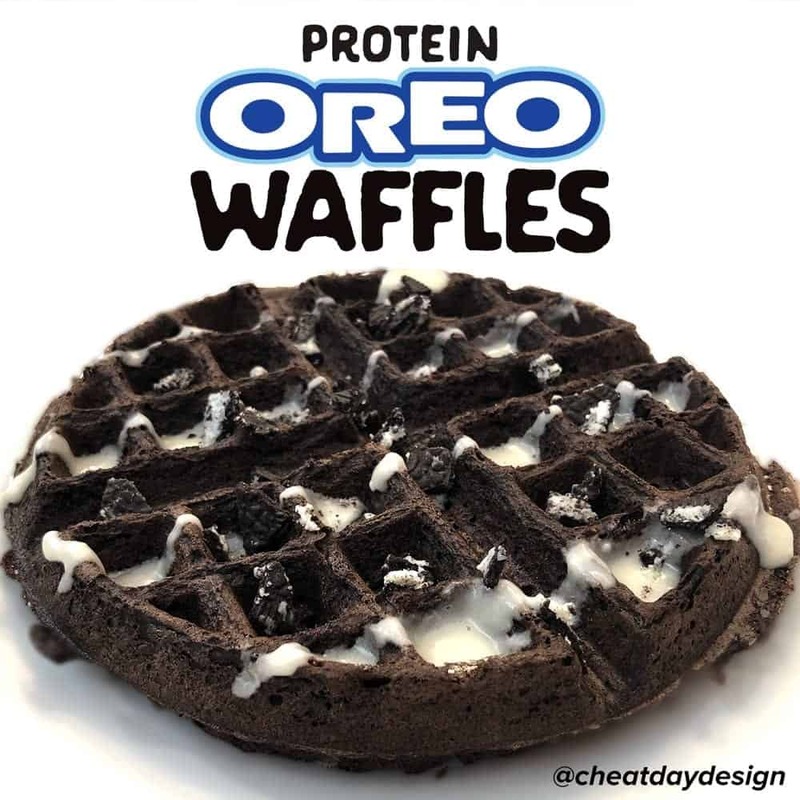 Each of these Oreo waffles, toppings and all, is only 210 calories and boasts an impressive 18g of protein! So what’s the secret? If you’ve ever cooked with whey protein, you know that things tend to come out really dry. Either that, or the “meh” flavor of the protein completely overpowers whatever it is you’re making. I recently joined the Bowmar Nutrition team and I can confidently say that their protein is second to none. 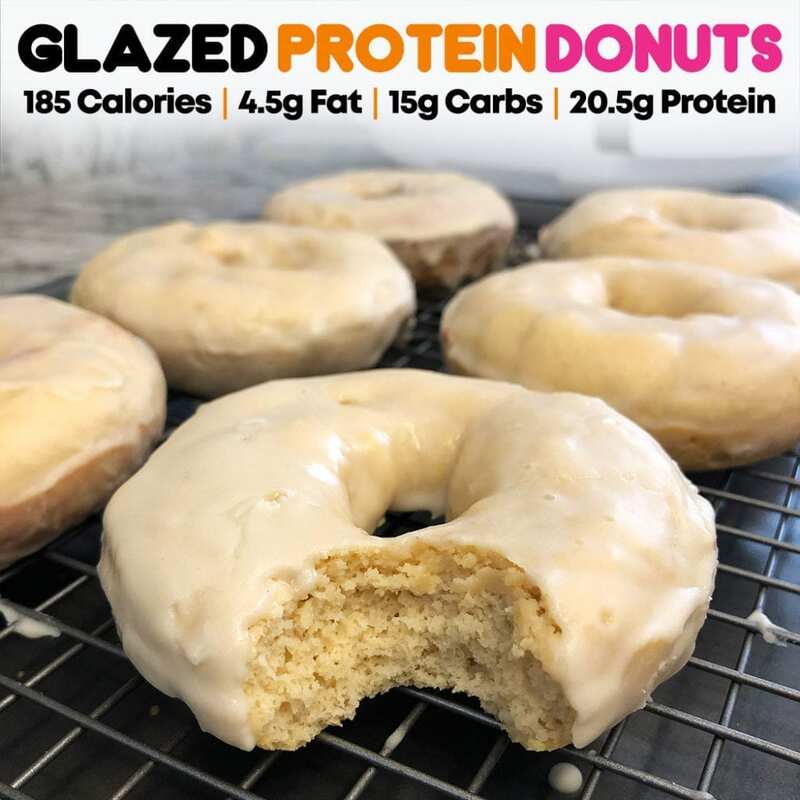 All of the flavors they sell are awesome, and they don’t have that gross protein taste that so many brands out there have. And no, I’m not just saying this because I joined their team. 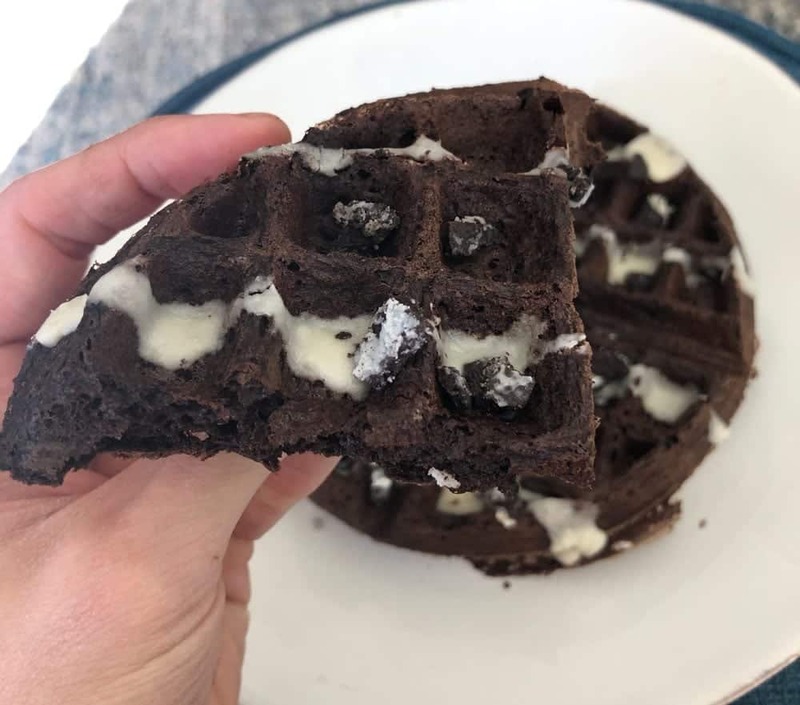 If you want to use another protein powder, you surely can- but I swear on waffles (a very serious thing for me to do) that their protein truly tastes better than anything I have ever tried. 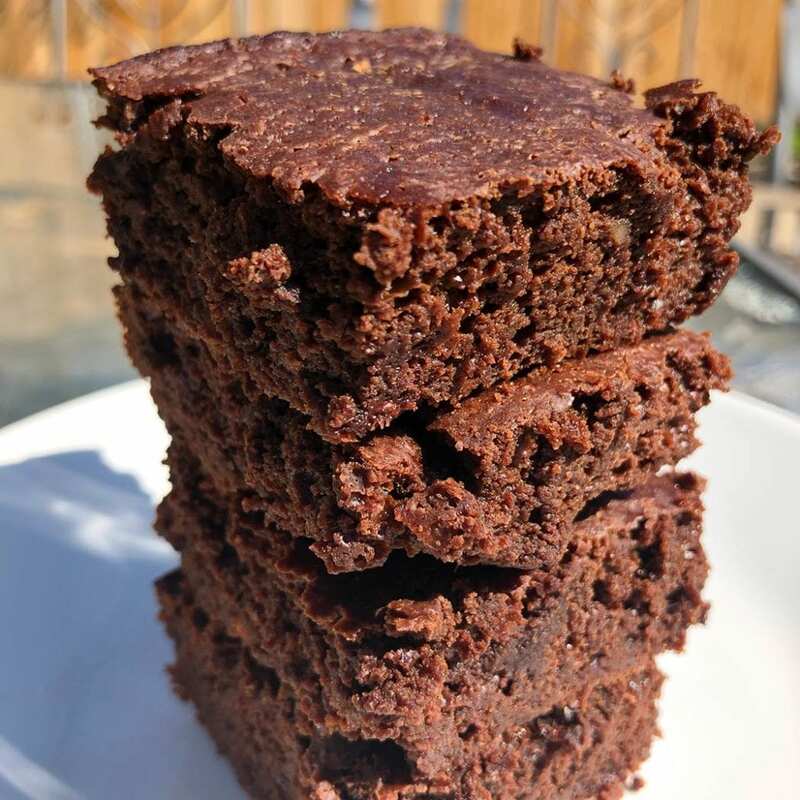 For this recipe, I used the Protein Hot Chocolate powder, which combines with the dark cocoa powder to create a perfect Oreo flavor. Swerve sweeteners are a must in this recipe. I’ve tried so many sugar substitutes, and the aftertaste they leave have always bugged me. I tried Swerve and was immediately hooked. I buy them off of Amazon, and while they may be more expensive than the sweeteners you’re used to, I promise they are worth it. I’m in no way affiliated with Swerve, I just really love their products. For this recipe, I used both their brown sugar and their confectioners (powdered) sugar. You can use another sweetener if you prefer- and if you don’t have powdered sugar, you can use a food processor or spice grinder to turn your own sugar or sugar substitute into powder sugar! All that being said, you can use real sugar if it’s your preference, the macros here will just obviously change. 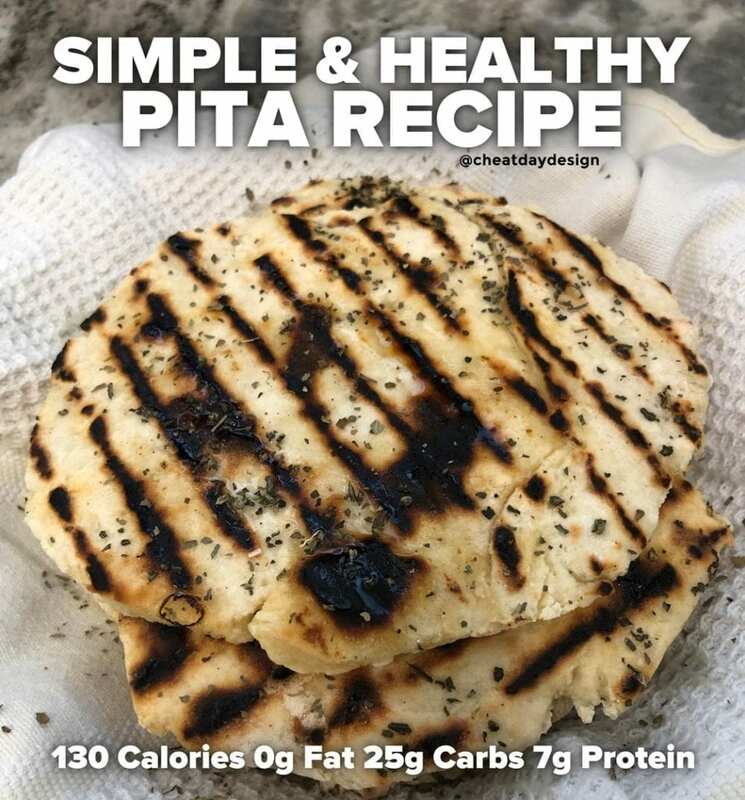 I’ll put some additional notes on possible substitutions below the recipe! In a bowl, mix together your flour, cocoa powder, protein powder, salt, and baking powder. Make sure it is all combined well! Add your egg mixture into the bowl with your dry ingredients and carefully mix it up. Don’t worry, we purposely left the milk out to this point! Now, slowly add your milk in a little bit at a time (slow is key) and continue mixing until you have yourself a nice batter. *Batter will thicken a little as it sits, so it’s okay if it feels slightly liquidy. Now that you have your batter ready, fire up your waffle iron to medium heat. If your waffle iron doesn’t have heat settings, you need to step your waffle iron game up. While the waffle iron is heating up, take your 20g of confectioners sugar and add in the tiniest splash of almond milk. Trust me, a little goes a long way. Mix that together until you get an icing that is thin enough to drizzle, but not too thin. If you added too much milk, simply add in more confectioners sugar until it’s the consistency you want. It is zero calories, after all. Once your waffle iron is ready, spray it with your cookie spray and add the batter in. Let those babies cook. Important waffle tip! Once they’re done, either put them on a paper towel or a cooling rack. If you put your waffle directly onto a plate, it will condensate and get soggy on the bottom, and nobody wants a soggy waffle! Drizzle with your icing and crumble an Oreo Thin on top and you’re ready to go! You don’t HAVE to use brown sugar if you have another sweetener handy. 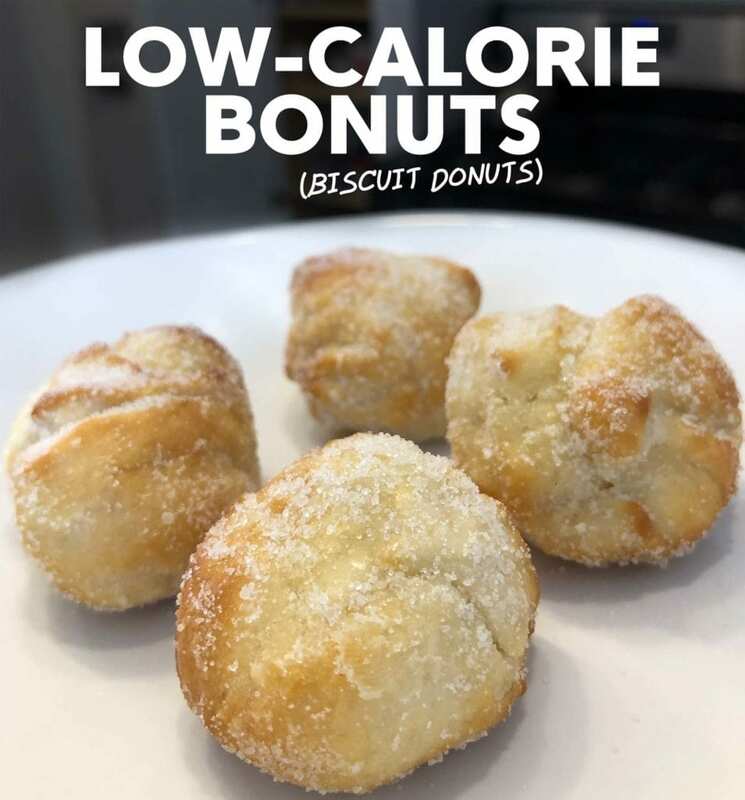 I like to use the brown sugar in this recipe because it adds extra moisture- like the above note, you want to be careful not to dry these out too much. Yes, you can use another brand of protein. But I can’t promise it will taste the same! Hershey’s Special Dark is just really dark cocoa powder, otherwise known as Dutch cocoa powder, so it helps to create that “Oreo” taste. 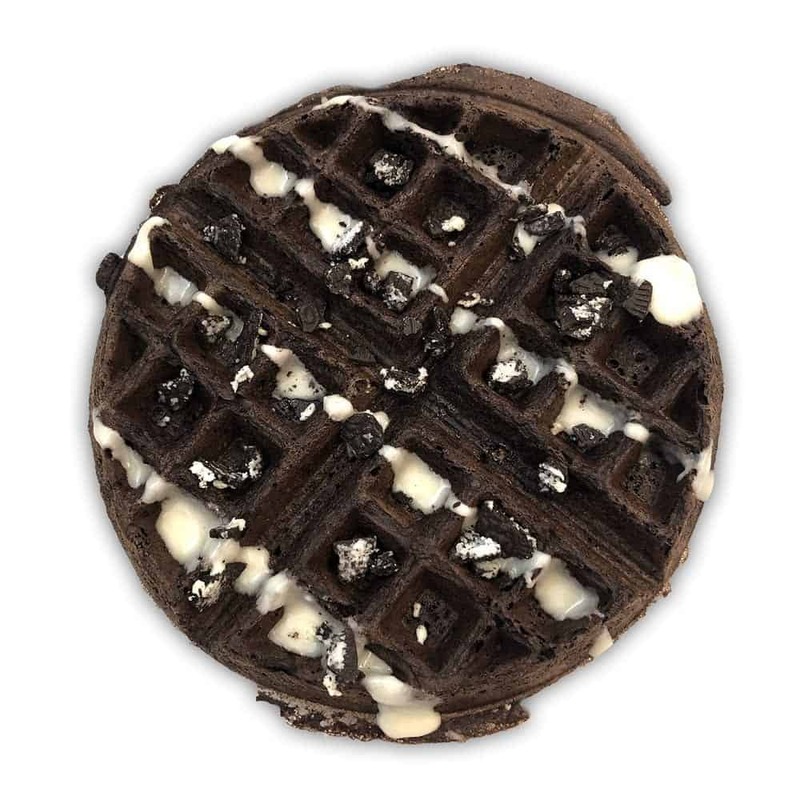 You can use regular cocoa powder if it’s all you have, but then you’re making chocolate waffles, not really Oreo waffles. Most grocery stores should carry what you need.